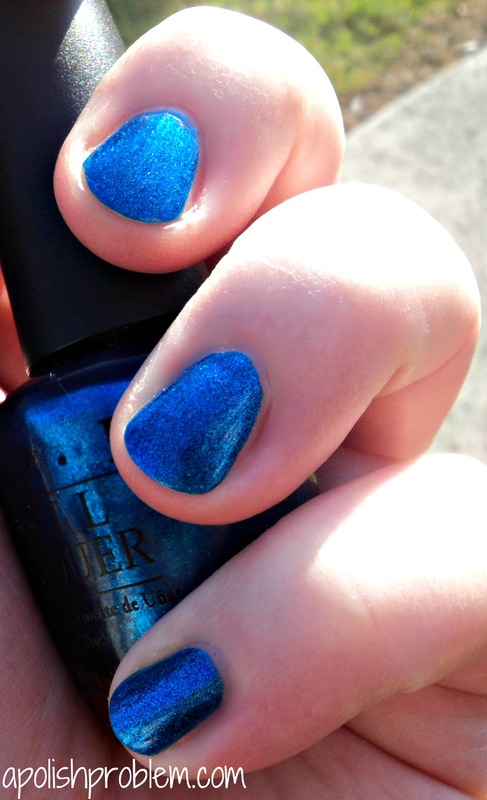 A Polish Problem: 30 Days of Blues for Autism Awareness - OPI Swimsuit... Nailed It! 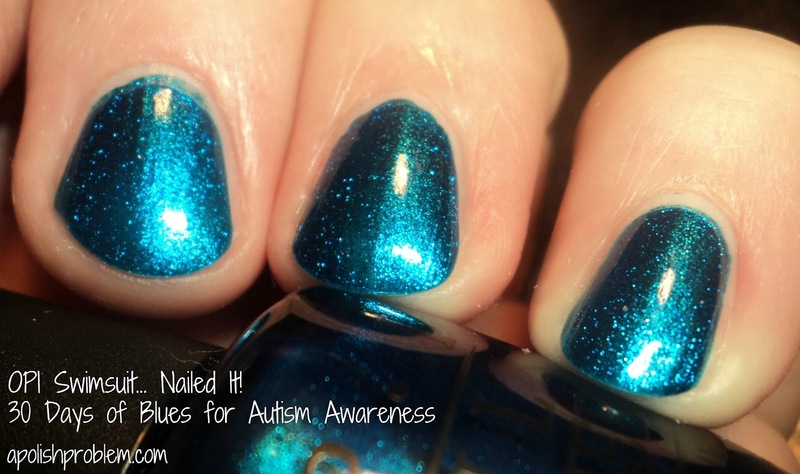 30 Days of Blues for Autism Awareness - OPI Swimsuit... Nailed It! Welcome to Day 9 in my "30 Days of Blues" for Autism Awareness. Today, I am posting quite late in the day because my previous idea for this manicure just didn't materialize. That seems to be happening a lot lately. Unfortunately, I couldn't figure out how to hold my right hand to get good pictures (it was quite a sight), so I apologize for my super-short middle finger. Here's a picture of it outside. This color is true-to-life, as my indoor pictures look a little too teal. Now, it's not a blue for the faint of heart, or for those that are just getting their feet wet in the blue-pool, but again, if you love blues, you need it. End of story. OPI Swimsuit... Nailed It! is not on OPI's website, so it may have been a limited edition color, but if you love it, a quick Google search shows me that it is still readily available for retail prices. OPIs retail for $8.50 a bottle. As always, thank you for reading my "30 Days of Blues" for Autism Awareness posts. If you are participating with me, or if you have a comment or a request for a particular blue polish, please shoot me an email to megan@apolishproblem.com. I have this one too!